Come along and meet some of your Fawkner neighbours on Neighbour day. Andrew Heslop, Communications Manager for the Australian Red Cross from Sydney, took action as a result of this tragedy and started Neighbour Day to enliven communities and neighbourhoods. He was invited to New York in 2008 to make a presentation about Neighbour Day to the United Nations. So, bring your family and come along to the Barbecue this Sunday at CB Smith Reserve. 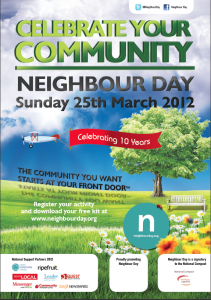 For more information visit the Neighbour Day website.